When it’s the holiday party season, having easy appetizer items are the best! 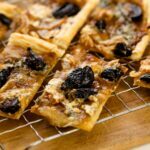 This caramelized onion tart with figs and blue cheese is a nice balance of sweet and tangy! Melt the butter in a 12-inch skillet over medium-low heat. Cut the ends off the onions and slice in half, end to end. Slice each half thinly to approximately 1/8 inch thick. Add the onions to the melted butter and continue to cook over medium-low to low heat. Heating too high will brown or burn the onions without caramelizing. Slowly cook the onions, stirring occasionally until they begin to soften and brown. Continue to cook until the onions are evenly light brown and just begin to stick on the skillet, 15-20 minutes. Remove from heat and add the vinegar, salt and pepper. Cool and chill until ready to assemble. Or cool to room temperature and assemble. Thaw the puff pastry overnight in the refrigerator. Working with one sheet at a time, roll out on a floured surface to 11 x 13 inches. Place pastry on a parchment-lined baking sheet. With a sharp knife, make a line around the perimeter of the pastry 1/2 inch in from the edge, making sure not to cut through the pastry. Stir together the Dijon mustard and fig preserves. Brush half of the mixture on one sheet of pastry. Sprinkle half of the prepared onions over the pastry followed by half of the sliced figs. Finish by crumbling half of the blue cheese evenly over the top. Bake in the preheated oven until the cheese is melted and the pastry is puffed, 20 minutes. Remove from oven and cool 5 minutes. Slice into pieces and serve.